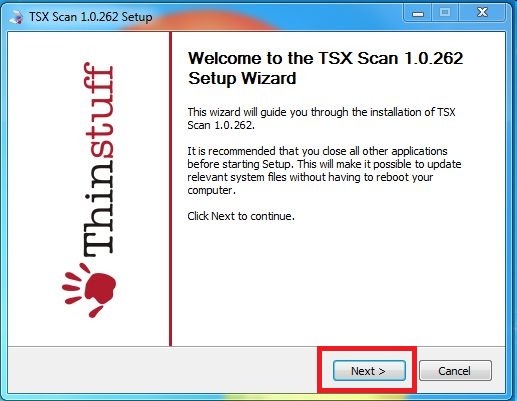 With TSX Scan you only need the TWAIN or WIA scanner driver on the client computer. On the server computer you need either XP/VS Server from here or Microsoft Terminal Server/Remote Desktop Services and in addition TSX Scan Server from here. On the client computer you need TSX Scan client from here. On the server you don't have to install any TWAIN drivers but on the client you have to install the TWAIN drivers for your scanner. So before you install TSX Scan we would recommend that you first test with any TWAIN capable application on your client computer if you can succesfully scan with the installed TWAIN driver of your scanner. WARNING! 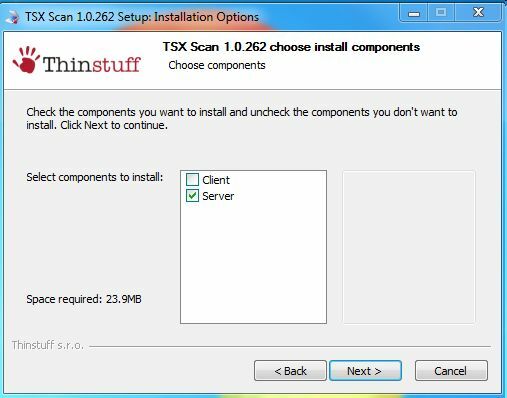 On Windows Server operating systems you have to install the "Desktop Experience" feature to install the TWAIN_32 subsystem which is needed by TSX Scan Server. 79. How do I install the Desktop Experience feature on Windows Server 2008/2008 R2 (example)? 1. 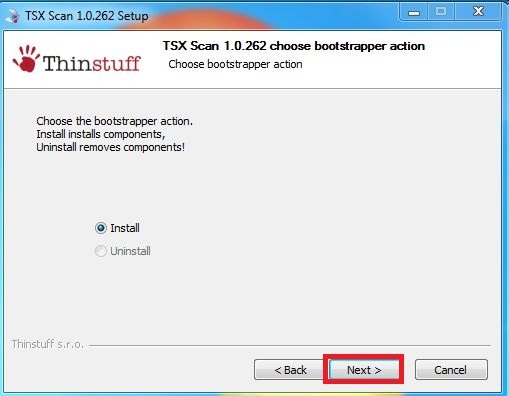 Download the TSX Scan installer from here, save it somewhere locally and execute the installer with a double click. 2. Welcome Dialogue. Select Next. 4. To proceed with installation you have to agree to the "End-user License Agreement" and the press “I Agree”. 5a. 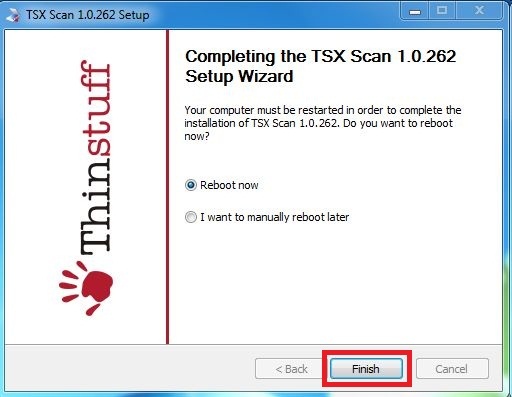 Select "Client" to install the client part of TSX Scan on the Client computer. 5b. Select "Server" if you want to install the TSX Server part on the server computer. 6. Select your destination folder and select "Install". 8. In the last step choose the button „Finish“.To complete the installation process you have to reboot your computer. Click 'Yes' if you want to restart now or 'No' if you plan to manually restart later. If you connect after installation of TSX Scan via RDP to your XP/VS Server or Terminal Server you should see the TSX Scan icon on the right bottom in the info area of your task bar as you can see per following screenshot. If you now start any TWAIN capable application (for e.g IrfanView) in your Remote Desktop session on the server and open the scanner selection dialogue you should already be able to chose the TWAIN scanner which you previously installed on your client. Those will have a [TSX] in front of their scanner name to differentiate them from local scanners. 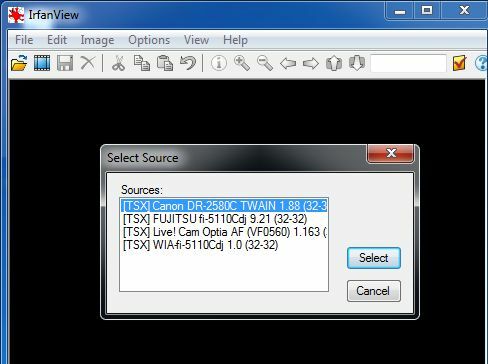 Do I need TSX USB for using TSX Scan? How do I install the Desktop Experience feature on Windows Server 2008/R2?